A 197 unit, U-shaped apartment building encompassing a large landscaped courtyard and an outdoor recreation pavilion overlooking the river for a total area of 215,999 sq.ft. This project has 3 separate entries, 4 elevators, and 10,000 sq.ft. of indoor and 20,000 sq.ft. of outdoor amenities and is considered to be the largest wood frame building constructed in one phase. A 14-unit townhouse and 54-unit apartment building with two levels of underground parking. The project faces three streets, each with different grade elevations. Townhouses are wrapped around the apartment building and have direct access to the underground parking and streets. 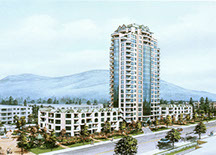 St. James is a 38 unit condominium apartment building with one level of underground parking. The building sets back on the second and third floors accentuating the symmetry of the floor plans and simplicity of the main façade. A 28 unit ocean view luxury apartment building over one level of underground parking. 113 units 24-storey concrete high-rise and 44 units 4-storey wood frame apartment building with 2 levels of underground parking, with indoor and outdoor recreation facilities for a total area of 198,000 SQ. FT.
A 97 unit wheelchair accessible senior housing complex with views to the North Shore mountains and the ocean. The complex has full senior housing facilities including kitchen, lounge, dining room, meeting rooms, marketing offices, hair salon, crafts room, library, spa and laundry facilities. This development is comprised of two separate buildings that house 140 suites and 5,000 sq.ft. of commercial at grade. The landscaped interior road is connected by a multitude of points of interest (i.e., the water and pergola features). A 60-unit apartment and 10 townhouses along Richards and Smithe street in downtown Vancouver is a unique example of designing a mid-rise development in an area surrounded by residential towers. A 58 unit three-storey townhouse development designed with contemporary Georgian inspired impression mixed with western architectural vocabulary in mind. A 15-storey mixed-use commercial / residential building with three levels of above grade parking located in downtown Richmond. The project contains 96 residential suites and 5,000 sq.ft. of commercial spaces complete with indoor and outdoor amenities. The development consists of six separate buildings with a total gross area of 368,000 sq.ft. The design comprises of 393 strata apartment suites, 12,000 sq.ft. of retail and offices, 9,000 sq.ft. of indoor and 11,000 sq.ft. of outdoor amenities all over one level of underground parking. A 7 storey concrete gold LEED residential complex over two levels of underground parking. Development consists of 3 separate buildings along two streets and a lane with 79 condominum and 6 town houses. A 7 storey concrete mid rise mixed use building with three levels of underground parking overlooking the ocean and the North Shore Mountains. This multi use complex offers commercial at grade, rental suites on 2nd and 3rd floors and condominiums on the upper floors. This small gold LEED mixed use development located at a prominent and visible intersection offers mezzanine and large private roof decks / gardens to take full advantage of ocean view. A residential complex consisting of 25 townhouses and 45 apartment condominiums over one level of under ground parking over looking the Northlands Golf Course and North Shore Mountains. A 10-storey waterfront hotel / residential complex with retail spaces at grade. The project contains 56 residential suites, 15 hotel suites and 7,000 sq.ft. of retail space complete with green roof, indoor and outdoor amenities. Copyright 2014 © F.Adab Architects Inc., All rights reserved.